If you live in the DC area, you've seen a Baltimore Oriole. They're on all the sports paraphernalia. But have you ever actually seen one? The Orioles logo is, surprisingly, a fairly good estimate of what you're looking for: a bright orange breast and shoulders, with black head, back, wings, and tail. The males are generally a brighter orange than the females. Orioles migrate to Florida, the Caribbean, and Central America for the winter -- we saw one in Guatemala one February. They come back to this area to breed every spring. And right now, they're building their nests. And the nests are remarkable: rather than resting on top of a branch like most birds' nests, orioles' nests are a long sack that hangs down from the branch. 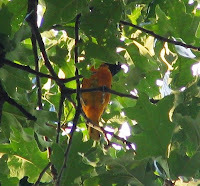 Orioles often hang out in treetops, which can make them hard to spot. This time of year, you might find them drinking nectar from a tuliptree, or nesting in a sycamore. Because they're so high up, though, the easiest way to spot them is to listen for their distinctive song, then try to find the singer with a pair of binoculars. Try listening to this recording of the song several times before you head out this weekend, and see if it helps you find one. You may realize they've been in your neighborhood all along. In your yard: Some people say leaving out fruit will attract orioles, but I've never gotten it to work -- the squirrels run off with it first. What did attract a pair of orioles right down to ground level in our yard several times this week was nesting materials: we left out a pile of old flower stalks broken into pieces, and various birds have been coming to the pile for weeks. In the wild: Orioles like forest edges more than dense forest. We've seen them in sycamores along Rock Creek and along the Potomac. For a bird's eye view, try stopping for a look if you're crossing one of the high bridges (e.g. Calvert St.) across Rock Creek, or try the bluffs at Scott's Run.